I realized today that I reached 500 tweets. Went from no social media to 500 tweets in 6 months whoo! And just as I was about to tweet about it, I thought to myself “Is this really the mile marker I want to celebrate right now? Seriously Kayla?” No, no it is not. 2013 was never about the number of Facebook friends I had or the number of people who followed me on Twitter or Instagram. For me, today is about celebrating all the dreams I have reached and the goals I am closer to achieving. It is about realizing that I stuck to goals from freshman year all the way to senior year and actually made them a reality. Now as everyone says in their “Year in Review” posts, 2013 was not all roses. But today I am celebrating those things, too. I saw a quote recently that said “Failure is not the end. It is a step.” Today I am rejoicing for those steps. And, as in every typical “Year in Review” post, there is the New Year’s resolution at the end. But mine is simple: to just be the best that I can be. For me, I don’t need the start of a New Year to set some new resounding goal. But it is a great time to recharge and prepare to continue along my path with an amped up and zealous attitude. I’m not scoffing at people who set flamboyant New Year’s resolutions. If you do, I sincerely hope that you stick to it and reach every resolution you set for yourself. But don’t forget that each new day is a chance to better yourself in some way, shape, or form. In 2014, do not wait for 2015 to set new goals for yourself. Start right then and there! What will you celebrate today? Most importantly, will you celebrate these things not only today, but for the next 365 days and beyond? How will you guarantee that each new day is an opportunity to make a better you for yourself, for Indiana, and for the future of agriculture? As I left the Indiana FFA Leadership for the last time for 2013, Ethan, Shelby, and I made our way south through the rainiest rainy weather we had ever seen to help the Crothersville FFA Chapter with their 25th Annual Toy & Food Drive. 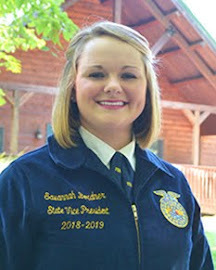 Not having any idea of what to expect, I soon felt right at home when we arrived as everyone was gathered within Ms. Maxis's, Crothersville FFA Advisor's, classroom eating a home cooked breakfast before the festivities started. As I visited with many of the members that I had previously met earlier in the year and making new friends, a group of the Crothersville FFA chapter officers led me to their gym to show me where all of the boxes they had prepared to deliver were. It was incredible… the gym was completely packed with food and toys for 93 families within their community. They raised over $10,000 to buy all of items to make 93 bundles which were prepared for peewee, small, medium, and large families. 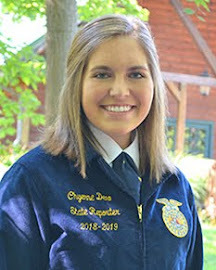 Madison Isenhower, Crothersville FFA Chapter Secretary, said "we will get emails, letters, phone calls, and sometimes some people will even come to the school" to figure out which families are most in need within the Crothersville community. Pictured below is what a large family in need would receive. They also passed out fruit baskets to over 165 families who have lost a loved one. Crothersville FFA purchased all of their fruit for the baskets from the Brownstown FFA Chapter. FFA members had been hard at work since the last drive ended, raising money from various events such as their annual craft show. FFA members spend hours sorting the food and toys into categories according to the different sizes of families, preparing fruit baskets, and making delivery plans prior to the delivery day. Delivering the items was the easy part and it was great to see the community come together to truly help those in need. The volunteer firefighters of Crothersville participate in helping deliver to the families and because of the rain, we were not able to ride on top of the big firetrucks, so instead we rode in trucks and various SUVs packed full of items or FFA members. The Jackson-Jennings Co-op even allowed the chapter to borrow a stock trailer. Pictured below is the local Sheriff's SUV full of items for a family as well as the stock trailer with items for about 6 families. Helping deliver food and toys to various families within Crothersville was one of the most humbling experiences I have had serving as an Indiana FFA State Officer. I asked Madison why she loved this event so much and she responded with, "it's all the happy faces and everyone being so thankful for everything they get! All the chapter members that show up to help is such a great way to show leadership and getting to experience all the weather situations…". The families receiving items from the toy & food drive were surprised, happy, and thankful. I am blessed to have spent the day with the Crothersville FFA chapter truly putting the last line of the FFA motto, living to serve, to action within their community. 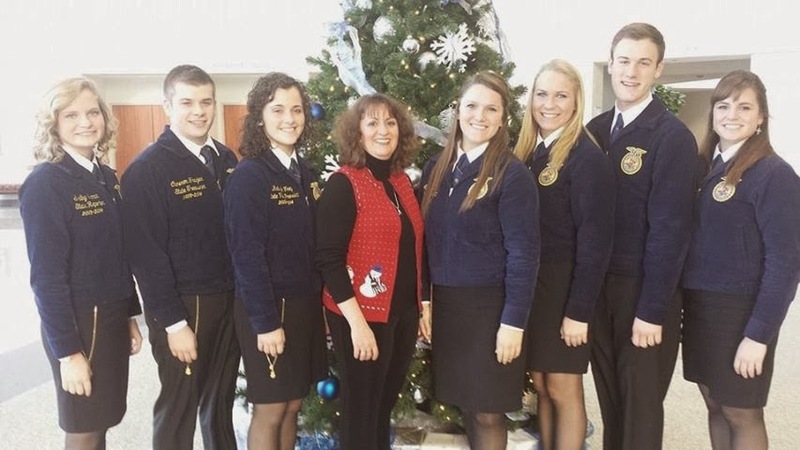 Everyone deserves to have a Merry Christmas and for 25 years the Crothersville FFA Chapter has made sure of that. Merry Christmas Indiana FFA members, thank you for blessing my teammates and I with a great first half of the year! Today is the day. Today that clock rolled over to show that we were exactly halfway done with our year of service. It’s hard to believe it! 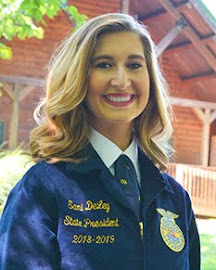 It seems like just a week ago that we were anxious State Officer candidates waiting to find out who the nominating committee selected to serve the over 10,000 members of the Indiana FFA. It seems like several days ago we were living at the state fair and enjoying all kinds of deep fried foods. 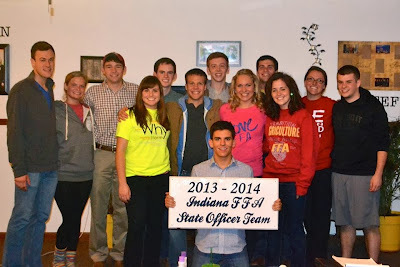 It seems like yesterday when we were on our three week tour of the state for chapter visits and district kickoffs. I guess it’s crazy how time flies when your having fun! 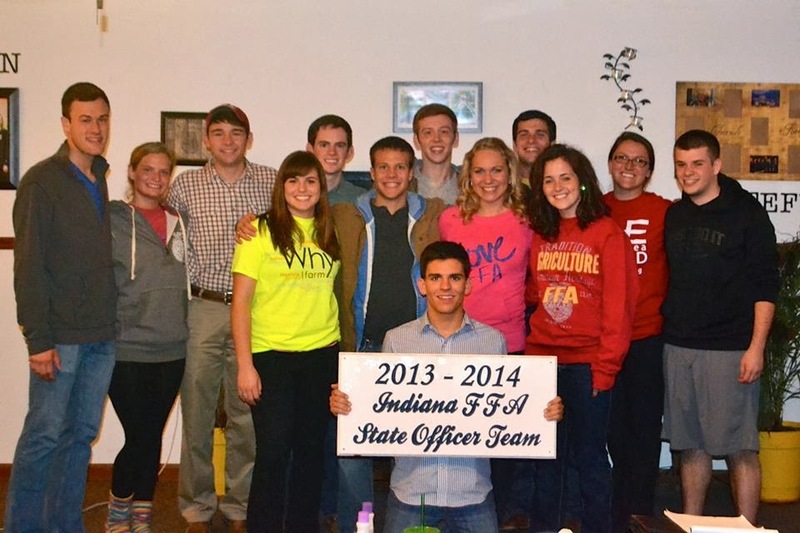 As I look back at the last six months of serving as the Indiana FFA State Reporter, I have so many memories. From the good, like when we got the opportunity to go underground zip lining on our fall retreat, to the bad, like when our gavel tap photo went public, I can honestly say that I have been so blessed and have enjoyed every second that the last six months had brought me. I told one of my friends that my term was halfway over and he responded with a simple question: What are you going to do with the half that you have left? Simple but loaded. I’ve been looking at it all wrong. I noticed that my year was halfway over not that I have a half of a year ahead of me. So what am I going to do with it? Hopefully I’ll get to see a lot of familiar faces and meet some new ones. Hopefully I’ll get to visit some chapters and be shocked and in awe at the amazing programs that cover the state. Hopefully I’ll make more memories with the 10,000 amazing Indiana FFA members. Oh but those are all maybes. You want to know what I’m really going to do with my remaining 182 days? You’ll just have to wait and see. The past couple of days we have been finishing up with our business and industry visits. 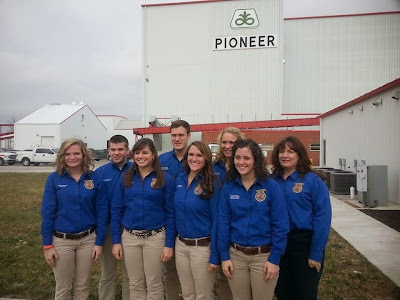 On Thursday we had the opportunity to go to Dow AgriSciences. While we were there we had the opportunity to tour and learn more about the company. Upon the tour we were fortunate enough to enjoy pizza for lunch followed by one on one conversation with some of the Dow employees. Following our visit with Dow AgriSciences we went to MacAllisters, there we met with Jay Shininger and learned all about their business. After wrapping up the visits on Thursday, Friday we had the opportunity to attend the 95th Farm Bureau Convention in Fort Wayne. We were able to walk through the trade show, followed by the lunch and the opening session. It is safe to say that Saturday was a day dreaded by most of the team. We had to wake up early and take our economics final exam. However, after powering through the exam Mr. Martin took us out to lunch in celebration to the end of the semester. To our surprise our families were there! Well most of them anyway. Turns out our parents had been planning a surprise Christmas party for us all along. We had a blast catching up with them and getting to spend the afternoon with them. 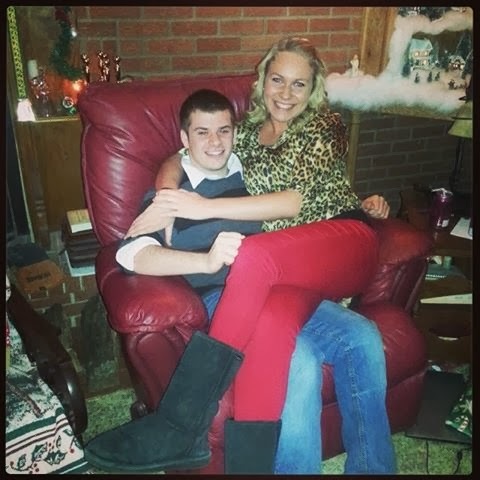 Still in the Christmas spirit the team went up to Shirley, IN where we got the spend the evening with Mr. and Mrs. Hickey. 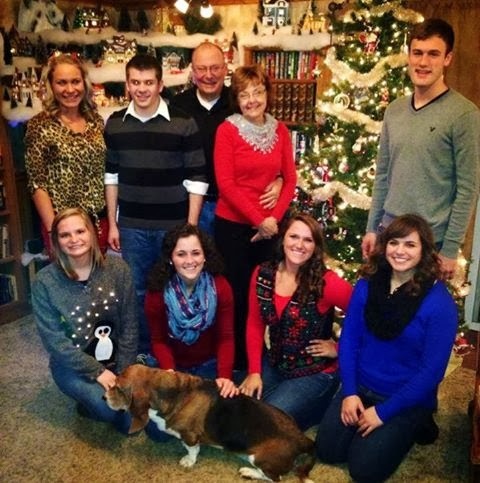 We had a blast watching the CMA Country Christmas and playing with their dogs. Not to mention the amazing homemade food! It has been a great week, but we cannot wait to go home this weekend to celebrate Christmas with our families. On Monday the state officers woke up bright and early and headed to Indianapolis to visit with Mr. Gary Fuller at Lilly. We began the day with a delicious breakfast at headquarters. We had a great time exploring the national headquarters. They have a timeline in one room that shows how the company has evolved from its humble roots. The company was built because Eli Lilly decided that medicines were not high enough quality. From there, the company grew and grew and is always on the cutting edge of pharmaceuticals. From Lilly, we headed to Elanco in Greenfield. Elanco stands for Eli Lilly and Company. While we were there, Ted McKinney shared his knowledge of hunger with us. Elanco is dedicated to combat world hunger. We were all so impressed with how driven the company was to be successful at fighting this issue. We had the opportunity to tour the facilities and meet with some of the employees. On Wednesday, we had the privilege to head north to Tipton to visit Pioneer. Pioneer is dedicated to the safety of their employees so got to wear hard hats and neon vests. We were so excited! We took a tour of the facilities and it was really awesome to see what goes into preparing the seed for the field. We are all very thankful for our partners and for the opportunity to visit them and learn more about their companies. 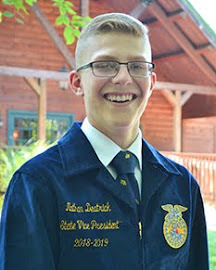 It is always an exciting life for us Indiana FFA State Officers, but recently I have been caught up in the excitement of the season, the future of agriculture, and Goodwill Partner Visits! On Wednesday, Sarah Dirksen and I attended the first ever AgrIInstitute "Though Leaders" series. While there, we caught up with people we had seen during our visits, listened to Lieutenant Governor Sue Ellspermann as she spoke about the bright outlook of the industry, and finally we were all ears at her announcement of the new Director of the ISDA, Ted McKinney. McKinney was an Indiana FFA State Officer, Purdue Pete, and most recently corporate affairs director at Elanco. It is an exciting time as new leadership enters the ISDA. Goodwill Partner Visits have gotten no less intriguing for the seven of us either. Following the announcement of the new ISDA Director, Sarah and I met with the rest of the team for a visit at Indiana Statewide REMC. We spent a lot of time discussing cooperatives and what that means to them as electric providers. In addition, we discussed that provide is a term to not be taken lightly because there are people who still have no electricity provided to them and a lower standard of living. REMC provides leadership opportunities for youth as well. 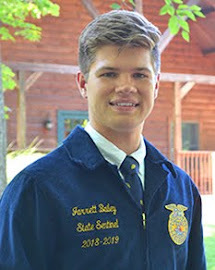 It means a great deal to us that our partners not only support the leadership development that the FFA instills, but also provide additional leadership training to children of their cooperative members. 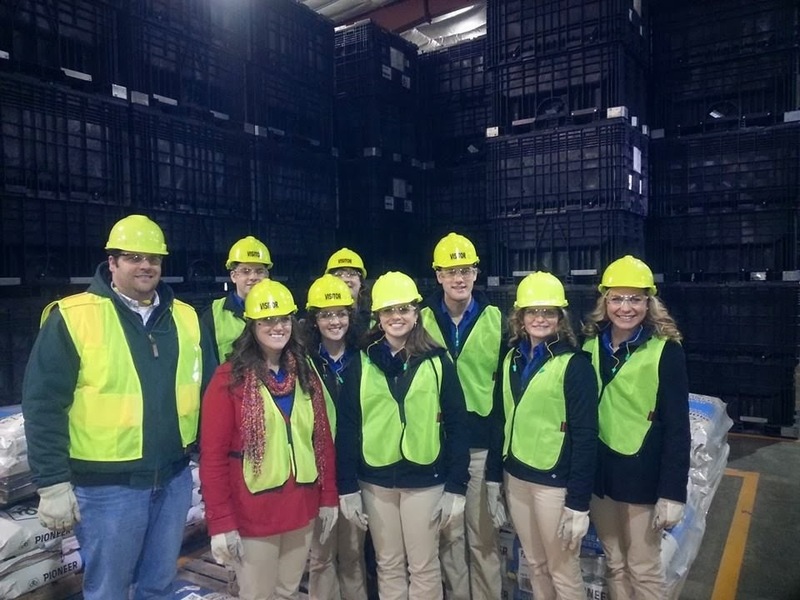 On Thursday, we were off to The Andersons to learn more about their ethanol processing plant in Logansport, Indiana. 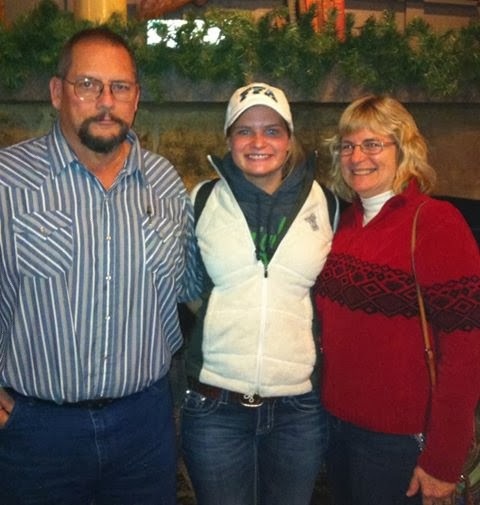 The Andersons talked a lot about how they utilize their grain storage capacity, high ethanol prices, and the value of byproducts together to offer agriculturalists competitive prices for their commodities. After we discussed the business and science aspects of the operation we toured the facilities. After our visit at The Andersons we headed just a few miles north to Cole Hardwood Inc. At Cole we toured a truly interesting facility. We saw the process from the grading of lumber to finished cabinet doors. We learned that Cole is a large exporter of hardwoods and they import exotic hardwoods like mahogany to put through their process. From tours like this to round table discussions to lunches and announcements it has truly been an exciting time for all of us! It is a small world after all. As an officer team each visit we attend drives that point home even more. After each visit when we debrief we find how close knit the agriculture industry truly is. We began our day at Indiana Farm Bureau in Indianapolis, discussing the importance of advocacy and the implementation of policy to allow agriculture to keep moving forward and their part in that task. During our discussion Bob Cherry offered a great piece of advice to all of us, “We should be trying to leave the organization better than when you entered it, your actions speak a lot.” Later, Farm Bureau allowed us to tour their facilities and meet numerous staff members. 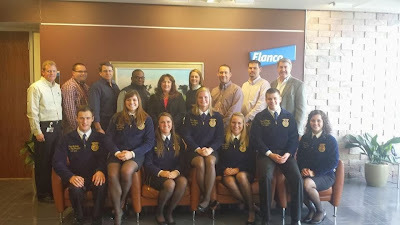 We were so grateful we had the opportunity to see Indiana Farm Bureau behind the scenes. Farm Bureau your support is greatly appreciated! Following the visit at Indiana Farm Bureau we went down 7 floors to visit CountryMark. We had the opportunity to enjoy a wonderful lunch with CountryMark and then continued to their conference room for a presentation where we were blown away by their marketing strategies and the complexity of their co-op. CountryMark focuses on five main areas in their co-op: Excellence, Improvement, Innovation, Integrity, and Reliability. 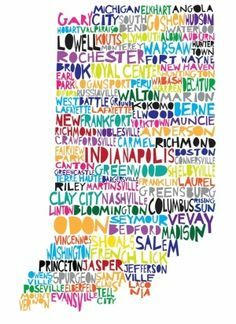 Not only do these five areas drive CountryMark to a prosperous future, but they are also incredibly proud to be Indiana’s only American-owned oil exploration, production, refining, and marketing company. Thank You CountryMark for your generous support! To finish up our day we piled in the Traverse and began our trip to Lafayette to meet with Tom Bradford, Crop Production Services (CPS) national recruiting manager, in his gorgeous home. 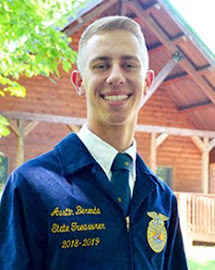 He explained all of the great parts of CPS and their need for sales representatives, because hit the nail on the head when he said, “The career to be is in agriculture.” Mr. Bradford’s biggest question was how to reach out to more students and interest them in CPS. He’s searching for students who are hard workers and want to succeed. We were happy to tell him that the FFA is organization to find those students. Thank so much to Mr. Bradford and CPS for letting us visit and start building our relationship. 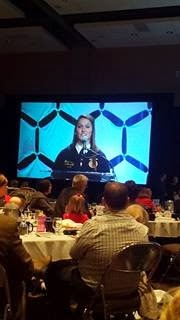 Farm Bureau and CountryMark are proud sponsors of Indiana FFA and we hope to build a strong relationship with Crop Production Services (CPS) so we can help provide them with opportunities to reach out to our members and inform them of all the opportunities available to them in FFA and agriculture. We greatly appreciate what each of these businesses are doing and thank them for all of their hard work and dedication to the agriculture industry. “Christmas, Christmas, Christmas time is here! Time for joy and time for cheer!” Thanksgiving is over and December has started, which means I am officially okay with Christmas decorations, Christmas music everywhere, and some substantial snowfall. With that being said, our team greatly enjoyed Thanksgiving because that meant we had five consecutive days with our families. For me, that meant more time on the road. Even so, it was nice to relax and set our tasks lists aside. Our time at home for Thanksgiving rejuvenated our team, and we are excited to take on the rest of 2013! 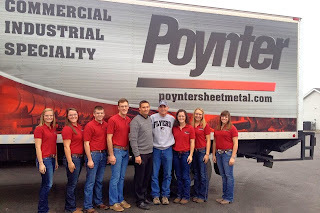 Today we started the season of Business and Industry visits with a trip to Poynter Sheet Metal in Bloomington. As a new sponsor, we knew little about the company when we arrived. But we left thoroughly impressed! Our team met with Don Poynter, former owner of the company, and Joseph Lansdell, the current owner, who explained to us how the company grew from one building to the 82,000 square feet complex it is now. 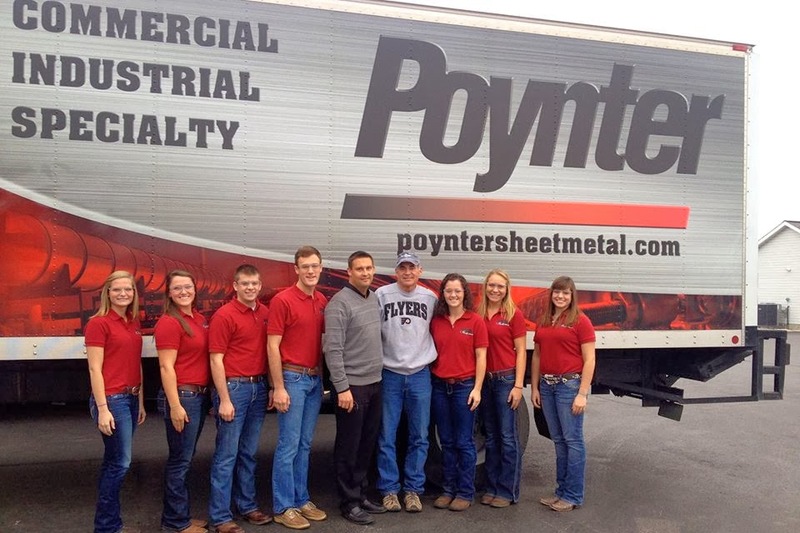 Poynter is now one of the top metal fabrication companies in the United States whose products range from industrial ventilation to monkey bars for orangutans at the Indianapolis zoo. Mr. Lansdell treated us to a tour of his facilities where we saw laser and plasmas cutters at work, breaks with thousands of pounds of pressure, and machines that turned flat sheet metal into circular ventilation ducts right before our very eyes. Projects that would take days in the little shop on our farm are completed in a matter of hours at Poynter. The experience was humbling for me because there I sat, talking to two men who helped to establish such an influential company, and not once did I feel any lesser than them. They are just two guys who used their intelligence and work ethic to build an empire. I think we all have something to learn from them. 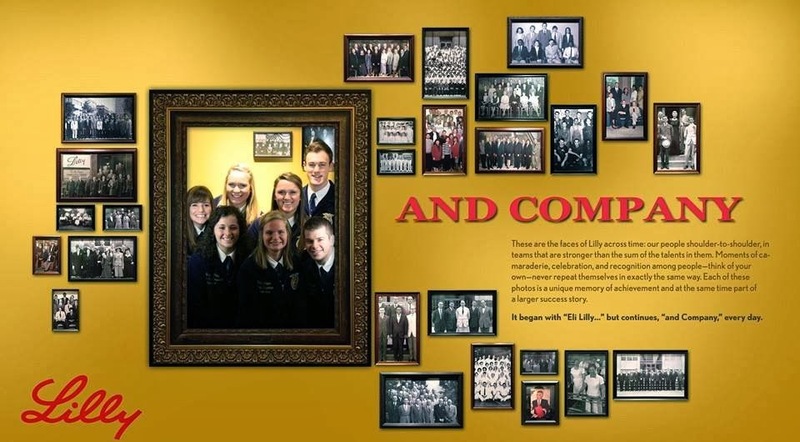 Just as the newest Hunger Games movie “Catching Fire” came out and movie theaters were packed, Indiana FFA members flooded the Leadership Center the past two weekends for the Foundation in Reaching Excellence Conference. Ironically, the 2013 FIRE Conference theme was inspired by the Hunger Games - “Catching Fire”. Pictured below are the State Officers dressed up as various characters from the Hunger Games for the opening session. 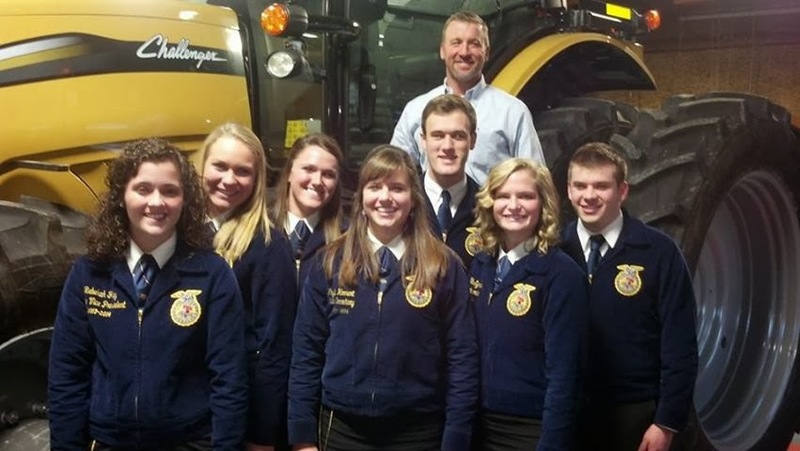 Over 300 FFA members had the opportunity to attend FIRE where they continued to develop their leadership skills, set goals, learn about Purdue's Agriculture Education program, explore service opportunities, and reflect on mentorship. 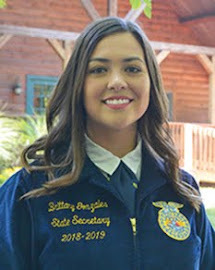 The FIRE conference helped FFA members continue to fuel their passion for FFA and the State Officer team and I are excited to see members ignite action within their FFA chapters and communities. With two victorious weekends in the book, we cannot go without sending a huge thank you to our sponsors Ice Miller LLP and Farm World. Our conferences would not be possible without continual support from our partners! 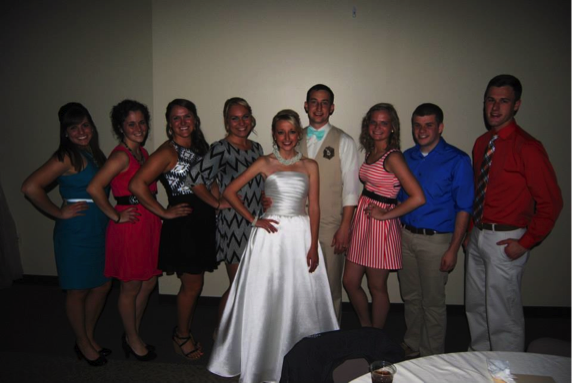 The State Officer team and I will be back in action on Monday, kicking off our goodwill visits. Have a safe and wonderful Thanksgiving! Soon after arriving home from the 86th National FFA Convention, the Indiana FFA State Officer Team quickly began working on F.I.R.E. But on Sunday we had some familiar faces stop by unexpectedly they came in the form of Brian, Mitch, Steven, Wes, Jackson and Jason, the newly elected National FFA Officer Team. Instead of awkward handshakes they embraced us with hugs, immediately after we gave them a quick tour of the state officer house. Then, all 13 of us hung out in the living room talking about anything from Shelby’s fear of the dark to when we found out that the center is haunted during Kayla’s surprise birthday party. We could have talked for hours but “the guys” had to head back to the Fellowship Cabin on the other side of the Indiana FFA Leadership Center. The next day as the National Officers were out to dinner, we decided to do some decorating for them. This came in the shape of steamers, saran wrap, foil, a strobe light for Cabin 4 (its haunted), giant orange street cones that we blocked several parts of the road off with and of course goody bags. You can say we were mighty proud of what we had just created. As they were heading back, we started phase two, paddling our sketchy old dock across the pond to the Fellowship Cabin. Our plan to scare them was a sad attempt. As they invited us in, we began to share with them what just happened. Then, showed them what we call the S.S. Seabass, In the midst of being outside at night, Mitch proceeded to run and I mean RUN away. We are still not sure where he went for the two hour span he was missing, but as he was missing the state officers, Wes, Steven, and Brian rowed the Seabass back to our house. Once back we chilled out in our office showing videos of us and Mr. Coty Back showing how he makes applesauce. We also once again chatted about anything and everything. Time shortly faded and they once again had to head back. The 2013-2014 National Officer Team is a group of truly passionate and down to earth guys. If only there was more time in a day to hang out. We can’t wait to see what amazing things they do for this organization during their year of service. Thanks for the laughs and good memories. So funny thing, Sarah just found a note from Mitch, a couple minuets before I was about to post. It said that he was waiting in our cleaning closet to scare us but mostly Shelby. The note was stuffed in our furnace in the cleaning closet. The mystery has been solved, thanks Mitch. I guess we should have paddled across the pond a little faster. 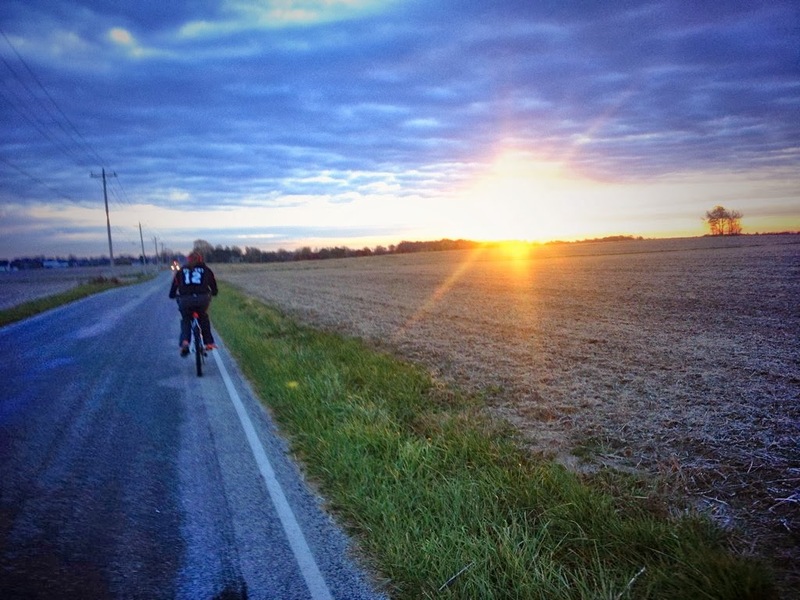 This morning, Kayla and I woke up early to go on a bike ride before our 9-5 PM office hours. With the time change that took effect last Sunday, after 5 PM it is just too dark to workout outside. After getting bored with doing YouTube video workouts in the middle of the living room, Kayla and I woke up a little earlier this morning, and by 7:30 AM we were on the road biking away. We left the Indiana FFA Leadership Center and rode our bikes around the block which totaled to be about 6.25 miles. It wasn’t until we hit the 3 mile marker as we were cruising down a hill that I realized how beautiful of a morning it was. I had never gone down the road we were taking and the leaves with the sun rising right over them was picturesque. Wow. Why hadn’t I realized how nice of a morning it was until then? Maybe because my mind was thinking about my to-do list or about my family back at home or maybe just because I was solely thinking about crossing the “finish line” back at the center and have completed my workout. Sometimes in life we need to slow down and enjoy the ride. It is inevitable that life will get hectic and many things will weigh down on our mind, but there is no written rule that says we are not allowed to enjoy this crazy ride. Every once in a while slow down, enjoy the ride, and appreciate what is right in front of you. Don’t let work consume your life, and if it begins to look like it is… go on a nice walk or bike ride and just enjoy the ride. Among the preparation for all the upcoming events, the state officers were able to take Friday and Saturday off to take a trip back down to Kentucky. The first stop was in Starlight, Indiana at Huber’s Winery. 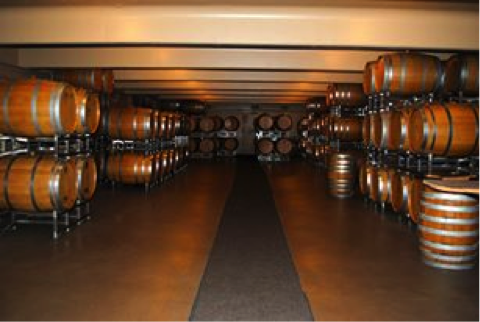 Huber’s Winery is the fourth largest attraction for agrirtourism in Indiana. As a team, we were able to tour their facilities and try some of their delicious hot apple cider along the way. Since no FFA trip is complete without some good food, we decided to stop for lunch before making our way down to Louisville. We decided to stop and enjoy Jack Huber’s family style country home cooking which was right across the road from Huber’s Winery. After a great meal and sharing many laughs it was time to continue our retreat onward to Louisville. Once arriving, the team had the opportunity to go zip lining at the Mega Caverns in Louisville Kentucky. 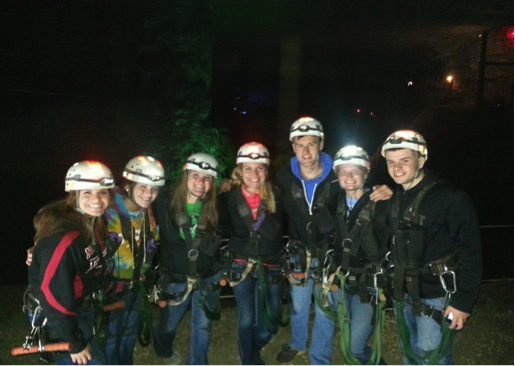 We all had a blast zipping through the dark caves, even though, Shelby got stuck in the middle. Concluding the excitement of zip lining the team headed back to the hotel to enjoy each other’s company and some Papa John’s pizza. The next morning was full of hair spray and fancy clothing as we all prepared ourselves for the two hour drive to Frenchburg, Kentucky. There we were fortunate enough to help our former assistant executive director, Coty Back, celebrate his wedding day. After the “’I Dos” were shared, it was only appropriate that we celebrated with some good ole food and line dancing. We were truly blessed to be a part of Coty and Nikki’s special day and we wish them a blessed future together. 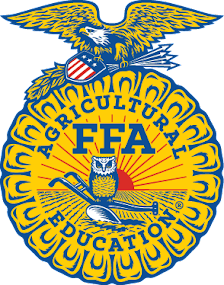 As the team and I prepare for another busy week, we look forward to spending the weekend with many Indiana FFA members for our first Foundations in Reaching Excellence Conference.